This is the first step in the SPF Insurance 5 Step process to get the life insurance your family needs. 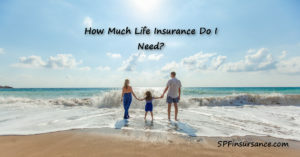 The question about "How much life insurance you need?" is straightforward. There are several valid ways to determine what the benefit level needs to be. We'll show you what the options are and how to determine the amount you should have in order to protect the ones you love. 5. Does a stay-at-home parent need life insurance? Today, most families rely on two incomes, so if one income is gone the remaining family may struggle financially. This is one of the reasons why the right amount of life insurance is important. 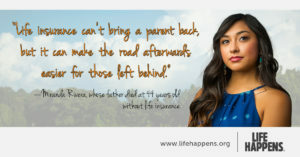 Replacing a missing income is part of what life insurance provides. Another is keeping your family plans alive. Putting the children through college, owning a home, and saving enough to retire comfortably. 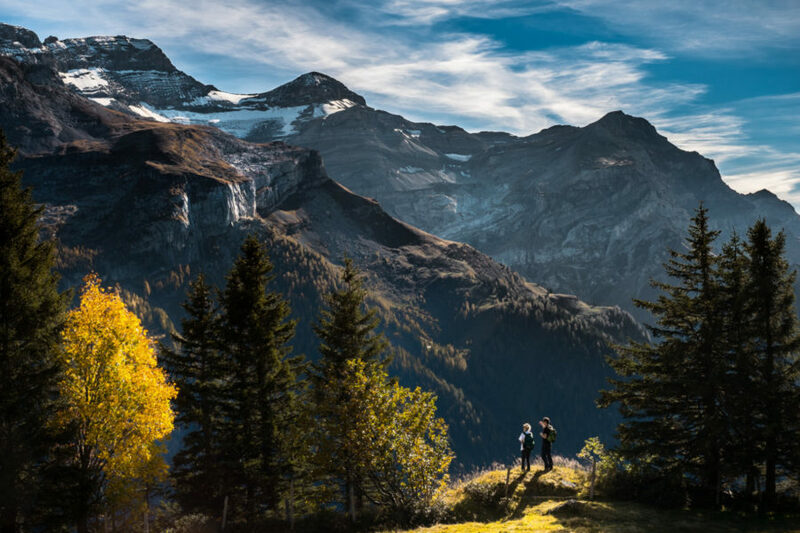 These plans and dreams can continue if your life insurance enables it. 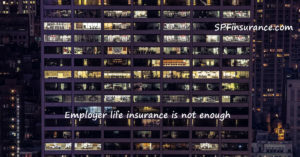 Many companies provide life insurance for their employees. If your employer does, the typical amount is equal to your annual salary. Employer provided life insurance plans can also allow you to purchase an additional amount up to two to four times your salary. 1. Assume your annual salary is $60,000 and your company provides you with $60,000 in life insurance. Plus, the insurance company also allows you to buy an additional 4 times your salary, which gives you an additional $240,000 in life insurance. Now you have a total of $300,000 in life insurance death benefit to protect your family if something should happen to you. 2. If something happens and you are gone, how long will that $300,000 last for your family? 3. If the household expenses are $45,000 each year and they draw that amount from the $300,000, then the money will be gone in less than 7 years. 4. 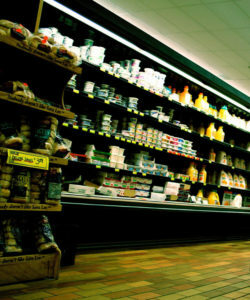 If the price of groceries, rent, and services increase each year during that time (inflation), the money will be gone even sooner. 5. At that point, your families’ life will have to change, perhaps dramatically. As you can see, life insurance you get from your employer is probably not going to be enough to protect your family. You will need additional life insurance to truly protect them if something happens to you. How do you determine the amount of life insurance you need? We’ll show you in the next section. In this section, we’ll cover the three methods to determine how much life insurance you need to protect your family. First, we’ll cover the two industry standard methods: Income Replacement; and Capital Analysis method. Then I’ll give you my simple method. Each of these three methods attempts to accomplish the same thing. Helping you figure out how much money your family would need if you were no longer around. However, the way the methods arrive at an answer is noticeably different. The Income Replacement method looks at your current income and how many years your family would need that income to minimize the financial pain of your loss. As an example, let’s assume you and your spouse are 35, married with no kids, and you make $40,000 per year. The Income Replacement method will ask how many years your $40,000 salary needs to be replaced, and then calculate an amount that would allow your spouse to withdraw the equivalent of $40,000 in today’s dollars. Let’s say you decide to use 25 years as the period your income should be replaced. Simple math says you would need 25 years times $40,000, which equals $1,000,000 dollars in life insurance. However, $40,000 dollars will buy significantly less 25 years from now. The income replacement method factors inflation into the result, along with an assumption that the death benefit money will be invested to grow during the 25 years your spouse draws money from it. With these factors added in, the amount that income replacement says you need is $702,573.26. The Income Replacement method works well for higher income California families that are already maximizing their retirement and emergency savings. This method does not work well for younger families where income and expenses are equal. The Capital Needs Analysis method combines all your savings and checking accounts along with your credit card and mortgage debts. Then adds any future expenses like college tuition or cars. Next it looks at your household living expenses. With these totals, the Capital Needs Analysis determines how much life insurance you need to take care of all these things. Using the same example from above, let’s assume the couple has a home with a $350,000 mortgage and $8,000 in credit card debt. They have no children so there are no future college expenses or other future large expenses. If the family living expenses total $30,000, and they have no savings or retirement accounts, then the total amount of life insurance they need would be $1,116,000. The Capital Needs Analysis method is good for California families with smaller savings, because this method pays off all debt and mortgage accounts and therefore reduces the future living expenses. Do You Need Life Insurance If You Own A Business? As a business owner, you must consider what would happen to your business if you suddenly not able to work, or were gone entirely. Could the business survive? What would happen to your employees? If you or your business have contractual obligations there could be legal and financial issues to address. If you have partners in the business, what happens to your share? All business owners need to consider their need for life insurance. 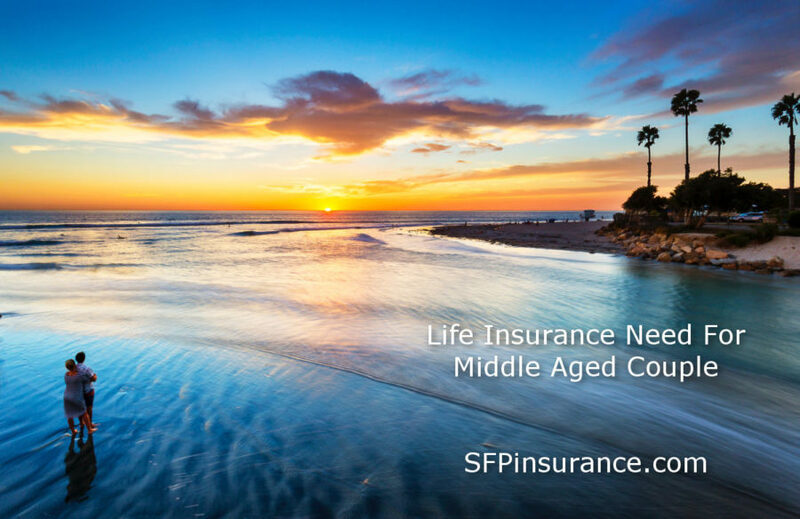 Call SPF Insurance and we can help you determine IF and WHAT life insurance you need. The Simple Needs method is one I developed for families on tight budgets. This method is based on finding a minimum amount of insurance that will have a big effect on the remaining families’ financial situation. 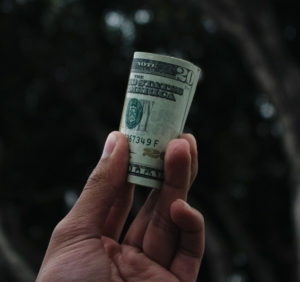 The Simple Needs method totals the credit and mortgage debts, and adds in an amount for funeral costs and an amount (about $50,000 to $100,000) to create a “recovery period” so the remaining spouse and family can grieve and then begin to take over full financial responsibility for the remaining family. This method greatly reduces the family living expenses such that the remaining spouse should be able to start a profession that will pay enough to provide for the family. The Simple Needs method is not a great solution, but it is better than leaving the family in financial ruin. Ideally, we’d like a life insurance needs calculator that mixes both Income Replacement and Capital Needs into a single tool. That is what the SPF Insurance needs calculator does. Here are some example situations we get a lot. Using these examples, you can learn how the final life insurance needs were calculated. These are all based on clients here in California. Starting a family is a big change and requires a lot of thought and planning to ensure that the transition from couple to family goes smoothly. Setting up a spending plan (aka budget) is the first step. Then getting the right maternity health insurance in California and putting in place life insurance are the next steps. The maternity insurance is fairly obvious. Having a baby can be expensive unless your health insurance provides good maternity benefits. Life insurance is also important because of what could happen to either person, and is only possible if done before the pregnancy occurs. Our young couple is Alexandra (age 37) and Manny (age 40). They both work full time and earn $35k and 48k. They own a home with a $410k mortgage, but have no other debts. They have saved $22k to help them pay for the baby and a 6-month maternity leave (Alexandra will go back to work after the leave). After entering the data into the SPF Need Calculator for Manny we get that he needs to have $726,253 in life insurance. For Alexandra, the calculator determined she needed $340,830. A key issue for Alexandra and Manny was wanting to make sure their baby would be able to go to college. When they added this option in the need calculator their life insurance needs were: Alexandra = $523,185 and Manny = $908,607. The college costs add just over $180k to the life insurance needs. In this example, our couple (Rob and Whitney) are both 45 years old and have no children. They have retirement savings of $85k, along with regular savings of $8k to cover emergencies. Rob is a contractor and makes $70k, while Whitney left a corporate job to become an author and is just starting out, so her income is $10k. Rob built their home 12 years earlier and they own it without a mortgage. How much life insurance do they need? When we plug their numbers into the Need Calculator we see that Rob needs to have $864,266 in protection, while Whitney needs are $0 (when the calculator shows a negative number the need is $0). In the next section, we’ll see how to handle situations where there is a large difference in income between the spouses. Does A Stay-At-Home Spouse Need Life Insurance? This is a great question and one that gets overlooked many times. In many families, if one spouse is the main breadwinner and the other spouse stays home to take care of the children, the belief is that if the working spouse has life insurance, the family is protected. However, this overlooks the true value that your stay-at-home parent provides, and the cost to replace those services if he/she were no longer here. As we’ll show you, it makes sense to have some amount of life insurance protection for the stay-at-home spouse. If the at home parent were gone, what services would the working spouse have to take on or pay for. This list is some of the common items. The decision to do them yourself or pay to have someone do them is your choice. The hardest ones for a working spouse to take on are the day care and the transportation activities during the week. If your career requires travel, then almost the full list of services will need to be replaced while you are away from home. 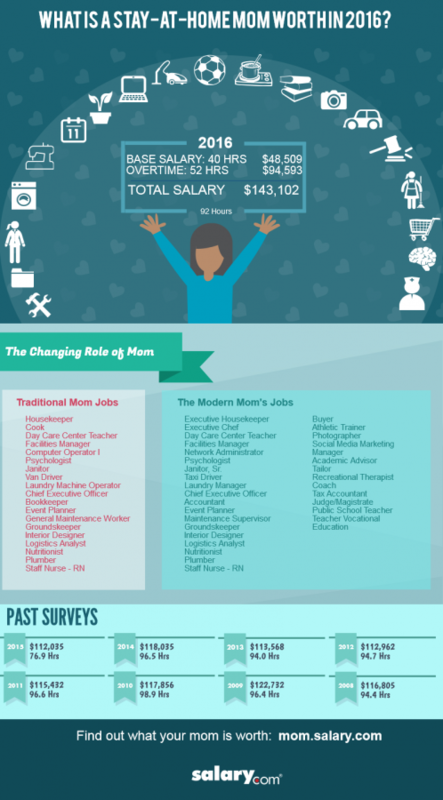 According to Salary.com, the total financial value of a stay-at-home spouse is $143,102. You can use their tool to determine the stay-at-home spouse “income” value in your family. The tool allows you to select the services and hours, along with adjusting the costs depending upon where you live. To use the tool, just click on the infographic. Once you’ve determined your stay-at-home income value, use the SPF Life Insurance Needs Calculator above to determine how much life insurance the at home spouse needs. In our previous example using Rob and Whitney, if we adjust the income that Whitney makes ($10k) by adding in the “jobs” she handles for the couple, we get an income of close to $50k. Using this income in the Need Calculator, we see that Whitney needs $162,094. Now that you've determined how much life insurance you need to protect the ones you love, you're ready to move on to Step 2. Tim is outstanding! He has the answer to any and all questions. He knows things about insurance that you couldn't possibly find out on your own. There are so many loopholes and details that we were not aware of that had a big impact on our decision. Tim made everything make sense. He spent a very long time on the phone with me, tirelessly answering my questions without any hesitation or shortness. Then he proceeded to call covered california on our behalf... If you have ever called there, you know the wait time is HOURS. It was a pleasure working with Tim and I would highly recommend him for ANY of your insurance needs. I would give him ten stars if it were an option and I am a picky customer. 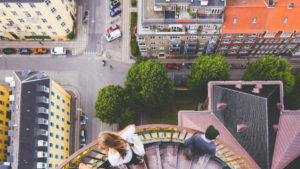 The next step is to figure out how long the insurance needs to last, so go to “What Kind Of Life Insurance Do You Need,” and how long does it need to last.